Have established written policies. Your Employee Handbook should set forth specific policies for attendance, tardiness, attitude, harassment, bullying and performance. Employees work best when they know where they stand. 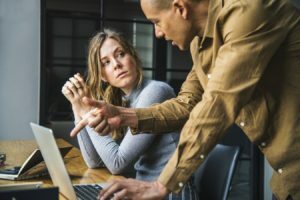 When specific policies are in place, employees know beforehand what is and is not appropriate and they are more likely to accept discipline for that violation. Reference your policy in support of your actions. When disciplining employees for known violations, referring to the policy will make it easier to explain your disciplinary action. If employees are shown a policy and then provided evidence of a violation, they have little recourse but to accept the effects of their violation. Be consistent but allow flexibility. The hardest thing for an employer is to find the balance between treating employees consistently and appreciating that all employees are not, and do not need to be treated the same. Ideally, an employer should treat each wrongful act the same for each employee. By example, your policy states that if you show up late 3 days, you are docked a day off; 5 days late, you are terminated. But what if it is your most productive sales person? Are you really going to fire them? The answer is to try to be consistent, but do not be so rigid that it hurts your business. Use the word “may” instead of “will” when referring to discipline in your written policies. Be cautious about money. Taking money out of employees’ pockets is the single easiest way to ensure they either quit or stop working to the best of their ability. In some cases, reducing wages, docking days off and cutting bonuses is necessary based on bad acts, but it should be a last resort. If the relationship has deteriorated to the extent that money is taken away in some form, you may want to consider termination. Remember, these people represent your Company, speak with your clients and interact with your employees. Bitter and angry people usually do not represent you well. In sum, know the effect the discipline will have on the employee before you do it. There is no easy answer to the best way to reprimand your employees. Following the above guidelines will at the very least provide you some basic steps to make it as painless as possible. If you are concerned about how an employee has or may react to discipline or whether you may have liability for terminating him/her, speak to a qualified attorney. Unfortunately, difficult employees may sue their employers even if the claims are groundless. The best defense is to ensure that yours and your employee’s actions are well-documented. Have questions? Contact us for a consultation. Learn more about how to protect your business in our related post – 6 Employment Law Mistakes That Can Cost Your Business.